Since forming in 2011, the Joy Mills Band has released four recordings: Trick of the Eye (2012), Cat & Mouse (2013), Deep Cut (2015) and Coming Up (2017) featuring their balladeering and soulful country songs. Joy Mills, on acoustic guitar and vocals, is joined by Lucien LaMotte on electric guitar and pedal steel, Tom Parker on bass and vocals, Jack Quick on keys and Mike McDermott on drums. It's a well-grooved blend of roots, rock ‘n’ roll, folk and country. Songs explore modern themes and characters that filter world-weariness through a lens of self-awareness. “Love, I'm hanging up my coat / been down that dusty road/ heaven's a seed / Sun, through the clouds well I don't know / nothing is as it is told / so what can be done.” Elsewhere, on “Coming Up” there is a simple beauty and comfort in the chorus: "I love when the robin sings / sweet things through an open door / and how I've been waiting for / these songs in the dawn." They've toured the west coast and northern Europe. They are each songwriters in their own right, and play regularly with other Seattle bands and musicians. Their latest EP, Coming Up ​was released March 2017. Mills spent 2005-2010 leading the Americana band, The Starlings. She and Tom Parker also perform as an acoustic duo. Mills continues to push the edges wider to incorporate classic sounds of early rock ‘n’ roll, country and soulful songwriting. The band’s repertoire maintains an urban country style filled with melodic interplay and layers of pedal steel and electric guitar set against the backdrop of the Pacific Northwest. In both her solo career and with The Starlings, Mills has garnered extensive reviews, chart-listings and favor both here and abroad. 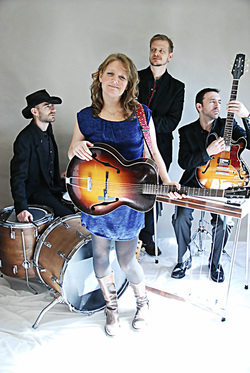 Trick of the Eye landed on Seattle Weekly’s Best Country Albums for 2012, and she was called by The Stranger’s Paul Constant, “Seattle’s liveliest country-flavored act since Neko Case.” She has supported such artists as Todd Snider, The Avett Brothers, Fred Eaglesmith, The Wood Brothers, and Eilen Jewell. She also provides backing vocals on multiple recordings – including Zoe Muth and the Lost High Roller’s 2011 release, Starlight Hotel, and 2012 release, Old Gold. Find more press here.